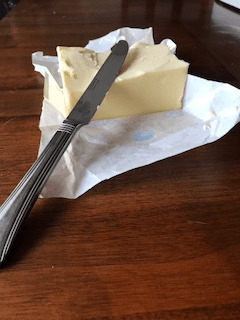 I’ve been ordering my groceries online and having them delivered for a while now (life-changing btw), and recently I accidentally ordered a huge slab of butter that looks like a brick. So buttering a piece of bread is currently super awkward because this brick of butter is rock hard and the butter doesn’t spread easily at all. The first time I kind of laughed and sawed off some more butter and gave it to him, then he did it again. “More butter!” And again. And again. At one point I worried that he was going to make himself sick by eating that much butter, but regardless, I kept going. You might be thinking, omg she’s a dietitian and she’s feeding her kid fists full of butter?! What a wacko! Before you go calling social services on me, keep reading. Child feeding expert and dietitian, Ellyn Satter, has created the Division of Responsibility (DOR) that lays out what parts of eating are the parent’s job, and what parts are the child’s job. She explains that the parent’s job is to determine WHAT, WHEN and WHERE meals and snacks are served – basically, the FEEDING. And the child’s job is HOW MUCH and WHETHER to eat – basically, the EATING. This is the formula that I was following that night at dinner. I had offered him bread with butter as part of the meal, and he was choosing to eat the butter in the quantity he desired. Because he is not deprived or limited in any type of food, he is free to listen to what his body says in the moment without fear that he won’t be able to get it again. Thus, he doesn’t overeat, and he didn’t make himself sick like I admittedly feared. It’s that fear that causes parents to step in and disrupt the DOR, which actually backfires and creates a power struggle with the food. Think about it – if you always tell your kid that he can’t have candy, what’s going to happen the next time he gets candy at his friend’s house or his grandma’s house? He’s going to go to town on it. So, every time my kid asks for more of something I’ve served at a meal or snack I’m going to give him more. That’s his right and responsibility to choose how much he eats (or if he eats at all in that moment – he doesn’t have to if he’s not hungry). What I won’t do is allow him to panhandle for food between meals/snacks or to ask for things that weren’t served. This is where my responsibility as parent is really important. I need to choose a wide array of foods over time, and I need to factor in things that are easy-to-like for kids (e.g. chicken nuggets, mac and cheese, goldfish crackers, fruit) and expose him to things that are more challenging (e.g. meat, veggies, spices) so he can learn to like them over time. If butter wasn’t served as part of a meal and he starts asking for it, I’m going to say no. Not because I think butter is bad for him or that it’s unhealthy. Rather, it’s because if I let him ask for things and accommodate him in that way, it sets up a dynamic where he thinks he can ask for and receive whatever he wants at a feeding. And I’m not about to become a short-order cook. If I made pot roast and he starts asking for mac and cheese, that’s how a picky eater is born. Sure, he may pick at the pot roast, or not eat any of it at all, and that’s fine. He’ll be really hungry for his bedtime snack (and at that time I’ll probably offer some thing I know he likes). It’s not about “winning” the power struggle or having the upper hand. It’s about maintaining the Division of Responsibility. And part of my responsibility as a parent is to help my child learn to love a wide variety of food, and continue to trust his body.